Former Virgin Radio Breakfast presenters Russ & Jono are being reunited for a daily show on Fix Radio from January. It’s been 20 years since they’ve been heard on the radio each day, but recently set up a podcast together Russ and Jono Rebooted aiming to recapture some of their chemistry from the 1990s. Their new show will include their classic features such as, ‘House Of Crap’, ‘Sad But True’, ‘Dumb Crime Of The Day’, ‘Probe the Globe’, ‘Lost In Showbiz’, the wayward newsreaders ‘Shanka & Edward’ and new features including, a film review, ‘Jono on the Kermode’ (commode) and Mike the Australian radio consultant – who will call up and tell the boys if they’re ‘nailing it’ or if the show need to be Fix-ed (Australian listeners may recognise Mike as the TV and radio presenter, Mike Hammond). 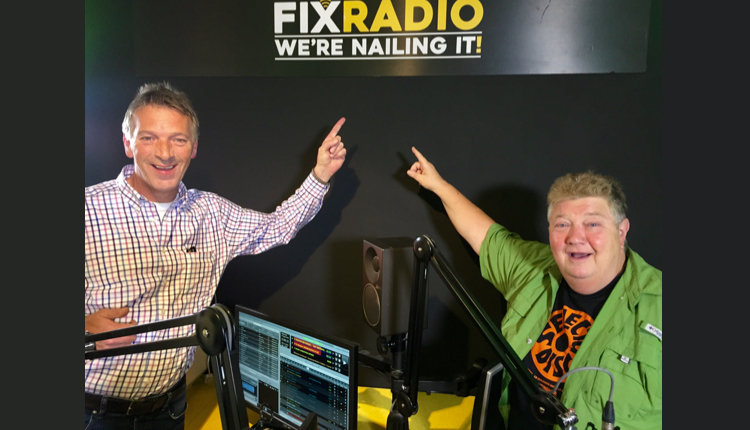 Fix Radio Programme Director, Graham Mack told RadioToday: “Russ & Jono are a perfect fit for Fix Radio’s blue-collar audience. A lot of them grew up listening to Russ & Jono. I can’t wait to hear them on the radio again”. Russ & Jono said, “Thank you very much indeed… to Fix for Fixing it for us to be together on the radio again. We are going to ‘Nail It’ and unite the UK’s tradesmen and women”. Fix Radio is on DAB around London, and will soon launch in Manchester. Further details of the new show will be announced soon. Will they be presenting the show live from a studio? Otherwise it wont really click. Russ is a fine presenter on his own. Dont know why he left smooth and lbc. Have heard him on Talksport lately. I remember them from years ago and often was in tears with their antics. I for one will be delighted to see them team up again. I thought Coleman had moved back to Australia? Will he literally be phoning it in? Obviously the career must have spluttered to a halt if this is what he’s reduced to doing. It will when they are given the prestigious 3am slot!